They were so much fun! And I love the finished result. I used Elann superwash so they can be thrown in with our regular laundry, and I took heed of the book’s advice that I might want a pair in all my favorite colors, so I have yarn in dark purple and moss green to knit at my leisure. Maybe I’ll get generous and knit some as gifts? Hmmm… we’ll see. I started these on aluminum dpn’s because I’d lost one of my bamboos. Let me just say, if you think you don’t like knitting with dpn’s but have only every tried metal ones, you have not given them a fair shot. I almost had myself convinced I don’t like dpn’s. Until I found my lost bamboo in the couch cushions and continued the project on those. It was *so* much nicer. And then it was a pleasure to knit these little guys. And then, my current project… I had a lot of misgivings about this one. 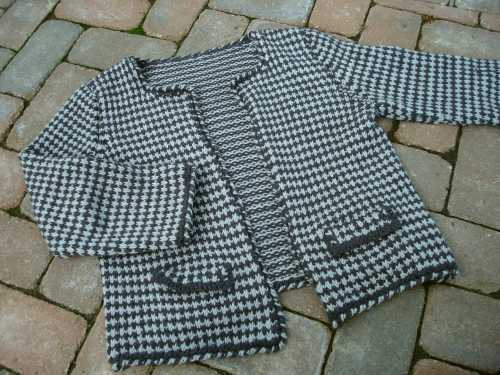 I really wanted to shy away from big projects after the Chanel cardigan. But the Starfish Shawl from Norah Gaughan’s Knitting Nature was calling to me. I really do need something to keep me warm in my over air-conditioned office. 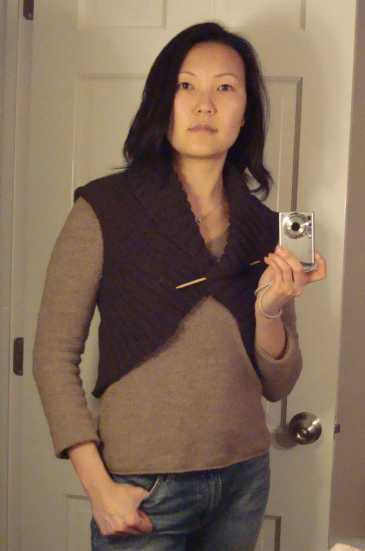 And this seemed like a nice, simple knit with a beautiful result. But, well, the cast-on is 730 stitches. Yeah. that’s kind of a lot. Doesn’t sound like a small project. But, despite this hesitation, I ordered the yarn (yummy Baby Cashmere Merino Silk DK). 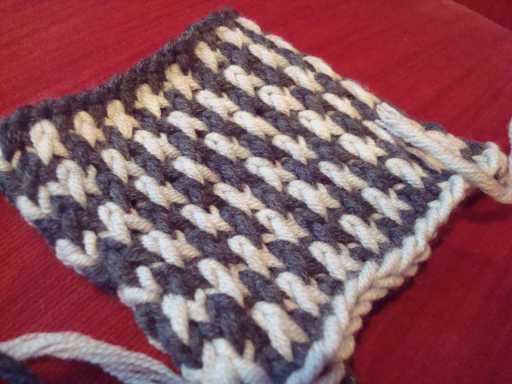 And then, despite the misgivings, I cast-on the 73o stitches (it wasn’t that bad at all, actually. I placed stitch markers every 50 stitches and it wasn’t that hard to keep count). And then I started knitting. And you know what? 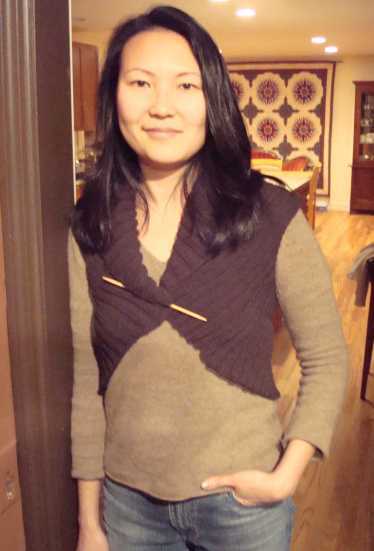 This shawl is just a pleasure to knit (if you try it, don’t forget to check the errata). I find it very soothing — between the repetitiveness, the lack of worry about whether it will fit, and the wonderful yarn, I am in heaven when I’m working on it. Learning to do the crab-stitching was probably good for me, and it definitely gives a nice, finished look. I’m still having some issues with the front of the jacket curling in. Oh, and I added a hook-and-eye clasp at the very top to keep the collar closed and neat looking. After all was said and done, I did end up with a piece of clothing I will wear, which is a good thing. I’m pretty much sworn off of big projects though. Being stressed out and frustrated by my hobby, which is supposed to be fun and relaxing, did not do much for my psyche. But I struggled through it and maybe I’m a better person for it? Maybe? 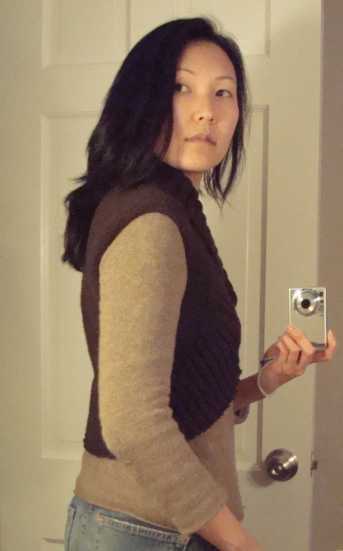 Now that that’s overwith, I’m going to finish up the nice, simple, stockinette Classic Sweater for Guys, and then maybe move on to my Honeymoon Camisole (which I’ve knit before, and enjoyed every minute of), and possibly some cable footies. Then again, maybe it’s time to do a little soaker knitting. It’s been so long, I’ve forgotten my pattern! It’s a learning experience, right? 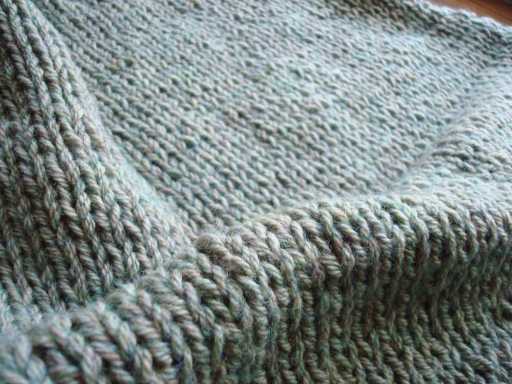 When you slip a knit stitch, you slip as if to purl. I used to know this, but I forgot. This little error of mine made my swatch look totally weird. 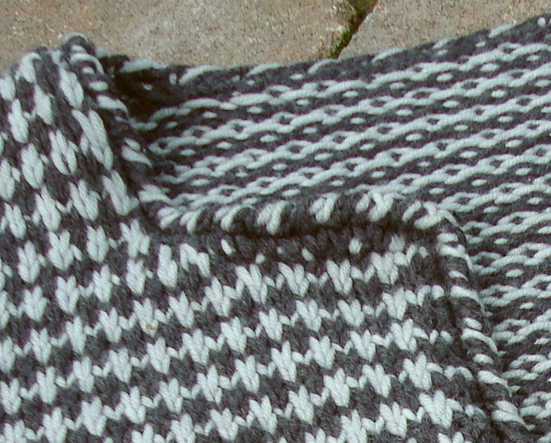 It was basically black and white stripes rather than a herringbone pattern. Not that attractive unless you want to look like a recent escapee from Sing-sing. I almost didn’t knit this whole project because I didn’t like how the swatch looked. Then it finally occurred to me what my error was. 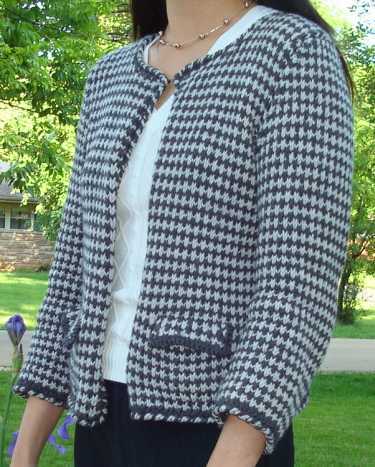 When you knit the pocket flaps, the pattern says just knit them until they measure 1 1/2″. Unless you want your pocket flaps to be totally off-pattern in a very noticeable spot, you need to be much more specific than that. 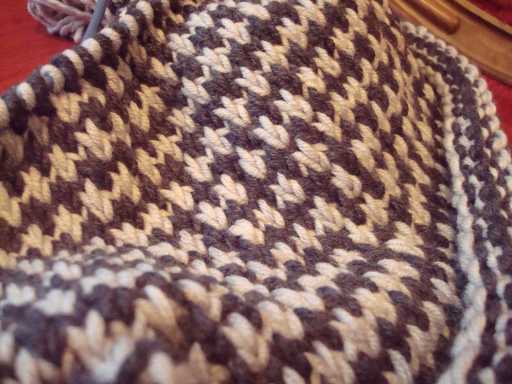 You need to end after row 1 of the honeycomb tweed pattern. 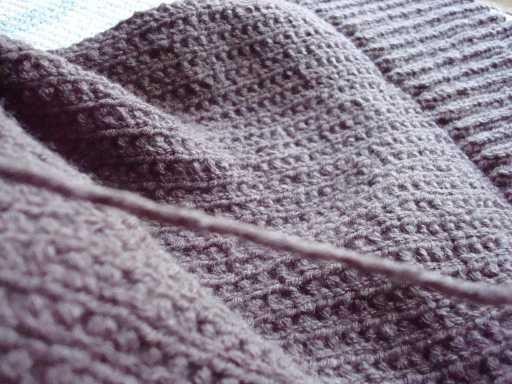 I.e., you should be knitting with the CC, and the stitches on your needle should be alternating in color. The instructions for “Insert pocket flap” were very confusing to me. It says “With WS of Pocket Flat in front of WS of Garment…” Mmmm…. “in front” to me means towards me, right? As in “with yarn in front, blah blah.” Well, that is not where you want the pocket flap. You should be knitting a WS row. You want the pocket flap away from you, against the RS of the garment, with the RS facing away from you. In other words, it should be laying on the piece exactly as it will when you’re finished, with the WS of the flap laying directly against the RS of the garment. I would have taken a pic of the correct way to do this, but I was way too pissed at the time to be taking photos. 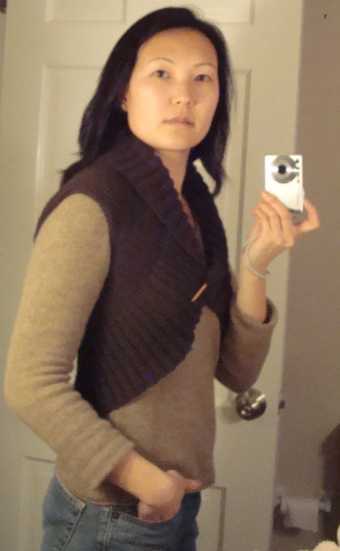 Plus, it was the third time I had knit those damn flaps in and I didn’t want to jinx it by stopping to photograph it. Comments Off on It’s a learning experience, right? Another FO — new record! 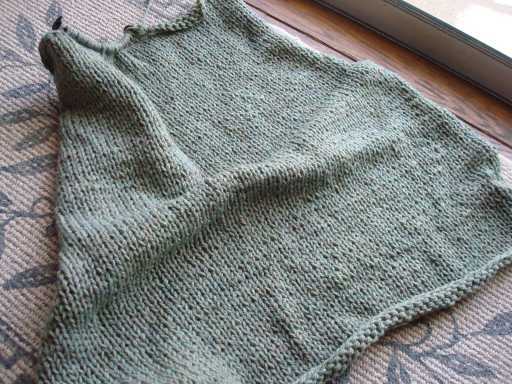 I knit this on 8’s, and at this gauge, it was 180 stitches across in the ribbed sections. This was a whole lot more knitting than I bargained for when I started out. I think I mentioned I was a few skeins short, but I managed to snag the last two skeins in-stock at Knit Happens (they seem awfully nice there — I wish I lived closer). So all in all, it took about 4 1/2 skeins to finish up. I had Julia model it for me, and now she wants one. Well, at least it would be a heckuva lot smaller. I told her I needed a break from this pattern, though and wouldn’t be getting to it right away. This ggh Solitaire is wonderful stuff. It’s soft and stretchy and gives a marvelous drape to the whole thing. Plus, it is super warm. I’ll definitely be wearing this baby to work next week! 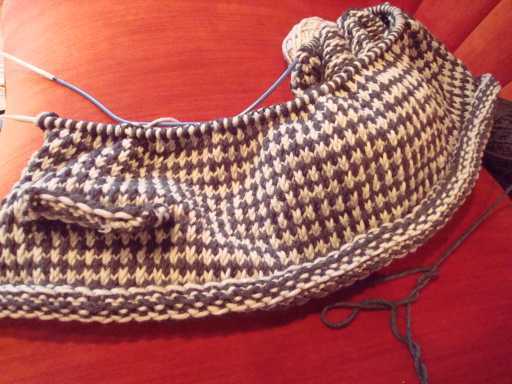 Oh, one thing to keep in mind when knitting this up — when you start the second rib section, make sure it’s opposite of what you did in the top section. 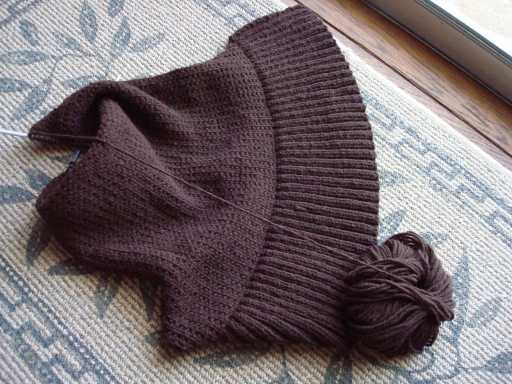 In other words, if you’ve got a knit 2 up top, match it with a purl 2 down below. I neglected to do this, so when I sewed it up, I got 4 purls in a row and 4 knits in a row along the seam. It’s not super-noticeable, but would have been easy to arrange differently if I’d been thinking ahead. So now I’ll be working more on Todd’s sweater. And I’ve purchased the yarn and done a swatch for the Chanel-ish jacket from Greetings. I’m just hesitating because I’m not 100% convinced I’ll like / wear it when I’m done. 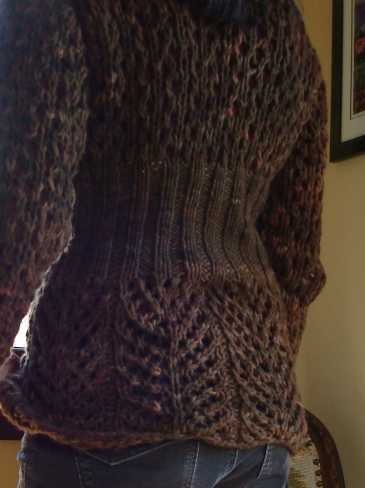 It looks great in the pics (as do all the ravelry FO’s), but maybe it’s not really my style? At this point, I’m leaning towards knitting it anyway. What the heck — I’ve got the yarn and it is sooo nice to knit with. Besides, I’m on a roll! I have to admit, when it was first finished, I didn’t like it. It seemed too bulky. But I’ve worn it a few times now and it’s growing on me. I need sweaters, so it’s made it’s way into my rotation by default. Then I was so inspired by this notion of simple knits (maybe I’ll never finish St. Brigid *sigh*) that I cast on two more projects. Does that yarn from the Classic Guy look familiar? It’s been my stash for at least 8 years and was supposed to be for Irish Moss. While that would have been admittedly very handsome, it may not have gotten finished in this lifetime. Now it has the potential to be worn this season. Back’s done and I’ll be casting on for the front in the near future. It’s a DK yarn, so I’m knitting it doubled and hitting gauge just right. The Circular Shrug may see some difficulties soon, because I didn’t buy enough yarn from the get-go. It’s this really nice GGH Solitaire. Very soft and nice drape. But it’s hard to find it anywhere! I got it at our local yarn store, Fiber Naturel, but it was their last 3 skeins. I’ll need two more, so we’ll have to see what turns up. And can I just say, Ravelry is an amazing site. I got to play around with it quite a bit right at the beginning of the holidays, and I *love* it!